Finally she began to calm down, to find her steely resolve. Some questions surfaced in her mind. "If you know what a monster he is, why haven't you tried to kill him?" "Well, I don't have as much invested as you do. And not only that, He recognizes me no matter what shape I take. 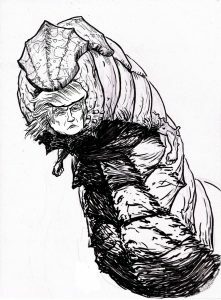 It's part of his genetics, the same part that turned him into the worm you see today. So, He has sworn to kill me on sight. I can't get close enough to do Him harm. However, He expects it from you, and He's arrogant enough to think you could never harm Him. And for many centuries, He's been right." Her thoughts reeled. "Centuries? So there's been gholas the entire time since His Apotheosis?" Jenner spoke in didactic tones as he slowly led her to a wall full of screens. "Yes, and your poor daughter is the way that you have lived for so long. The ghola technology requires shared genes, unlike regular cloning." The screens they halted in front of were divided into different images. Images of girls and women. "Look closely." Hillary squinted, getting a better view of the screens. The girls and women in the screens... were all her. Young Hillarys, all of them. A loose count of them told her there were at least four dozen of them. "Oh... my... God... where..."
"This palace is very large. It's bigger than some number of city blocks back in Hillary Prima's day. Each of these gholas, like you did, has her own sizable living space." Hillary's ambition found its base. She could improve everything for all of the inhabitants of this new universe in which she found herself. She and her continuous line of gholas could usurp the worm and bring about a glorious new age. A New Age of Hillary, thanks to her poor daughter, rest her soul. Her sacrifice would not be in vain. If only Hillary had a weapon. "I need a gun, Jenner." "Nooooo no no no, you've tried that a few times already. It has never ended well for you. You're going to need patience and a new approach." She was thirsty for violence, but decided to hear Jenner out. "What do you propose?" Jenner began weaving a plan as Hillary listened to him intently. "Okay, do remember the Huffington Post? Well, it's a little different now."